Filled to the brim with rich antioxidants and vitamins, this boldly delicious and (secretly) nutritious side will soon become a staple at any fall gathering. 2. Wash & dry brussel sprouts and cut into halves. 3. 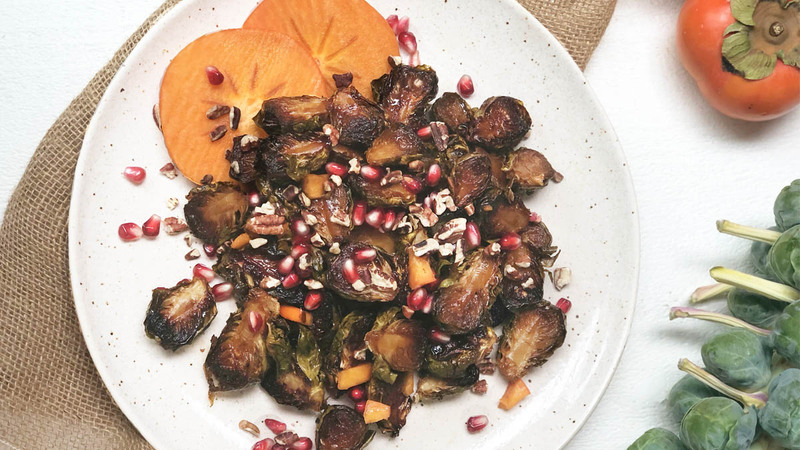 Toss your sprouts in Coconut Oil, Maple Syrup and Balsamic Vinegar and spread on a baking sheet. 4. Bake for 30 minutes, toss / flip and continue to bake until crispy, checking frequently. 5. Once slightly cooled toss in persimmons, pomegranate seeds, and pecans then serve immediately. - Enjoy!